Paradise is the sixth Steve Adamyk Band full length. I was trying to think how many bands there are that I have six great records by. It's not many and the ones who have that many have probably been kicking around my record collection since the mid 90's. If you look at this specific decade, since 2010 there isn't anyone on the planet who has put out as much great music as Steve & co. It's amazing. You can say a lot of great things about Steve Adamyk band, but if there's one accolade I want to bestow on them it's that there isn't any band that kill the opening track of their record as hard as these guys do. And they do it every single album. "The Letter" starts things off with a bang. It's built off of a simple, catchy lead guitar riff, packs a knock-out chorus and has the perfect backing 'oooooh' vocals that elevate this great song even higher. From there it's off to the races with hit after hit like "In Death," "Something Vicious, "Left In Pieces" and "The Deep End." That list is comprised of the faster, punchier songs that I like best. But even when they slow it down on a song like "Waiting To Die Part 1" or "When I Was Gone," There's so many great hooks and energy crammed in. Nothing feels like filler padding out an album, every song on here stands out as something great. Production-wise, everything sounds full and clean. They've managed to find that sweet spot between slick production and still being rough enough around the edges to not feel over done. Nothing I'm saying could possibly be a surprise if you've read this website with any sort of regularity. 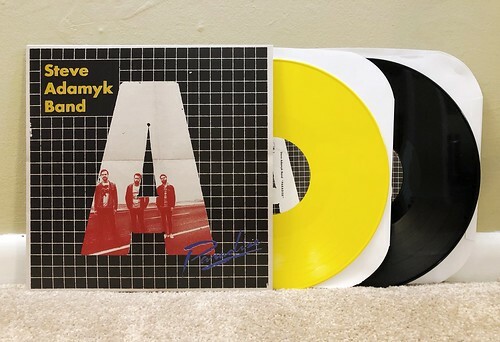 I've been saying great things about Steve Adamyk band since I got their first 7" on Ptrash. Paradise is just another fantastic record. Go buy it and the other five.